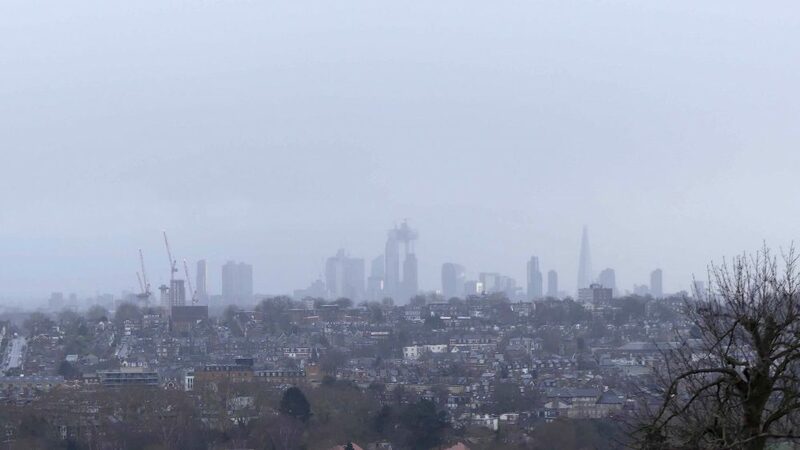 Near the top of Hornsey High Street there are intriguing glimpses of a stone tower seen from the pavement through a screen of tall trees. 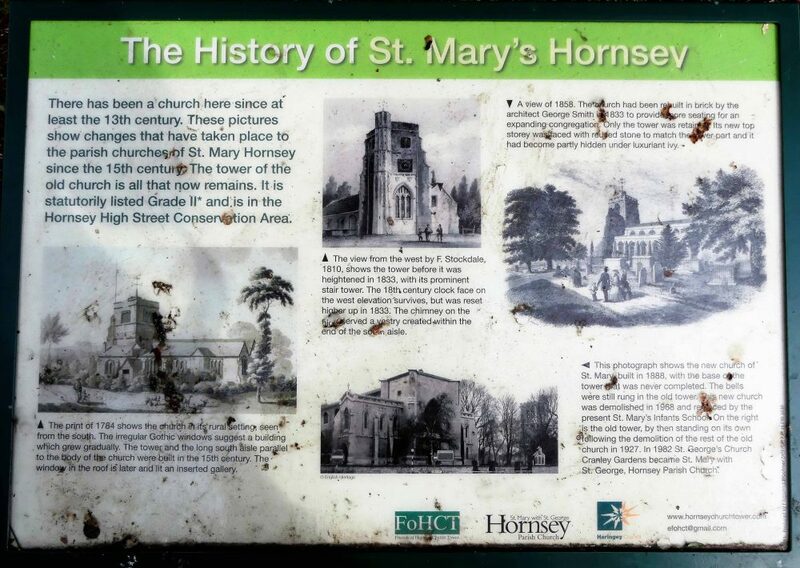 This is all that remains of St. Mary’s Church, the Parish church of Hornsey. The tower is a listed Grade 11 building and is within the Hornsey High Street Conservation Area. 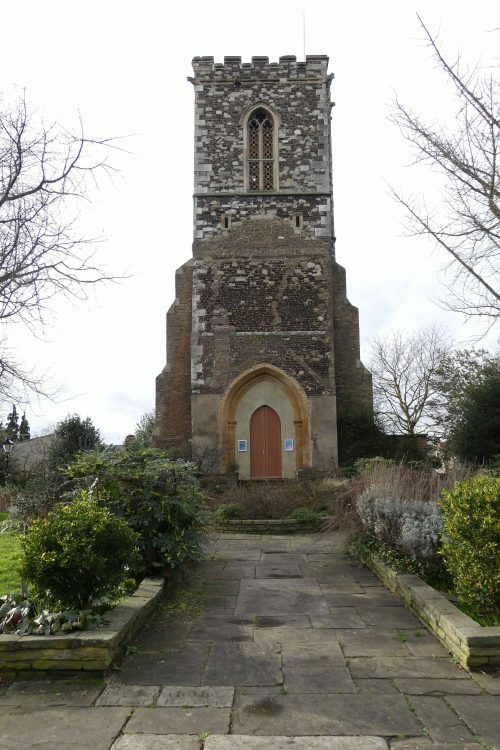 I think it may be possible to arrange to see inside the Tower; I’d like to do that, I do love old churches. 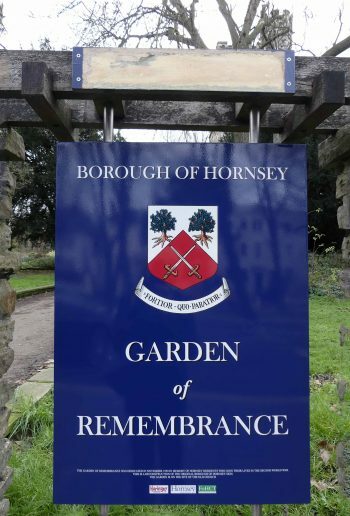 A sign set into the boundary wall of the tower’s grounds informs that this is a Garden of Remembrance and is a calm little oasis where people and wildlife can take a few minutes away from the busy High Street. It seems to be valued in the community and its gardens are always well-tended. A quiet walk around the gardens is always a treat and today I made it a diversion on my way to the supermarket. 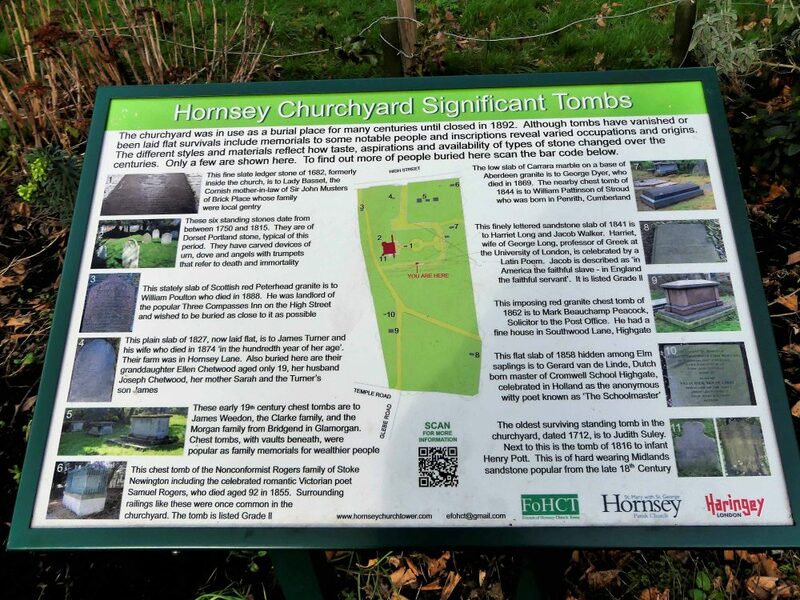 I walked around, stopping to read the information board about the graves and tombs within the grounds. I hadn’t noticed before that one of the chest tombs is the final resting place of the Morgan family from Bridgend in South Wales. It might seem odd, but this piqued my interest as Bridgend is where my two daughters were born and close to where we lived as a family for 17 years, and now one of my sons lives just around the corner from where they ended up. It might also be of even more interest and relevance to any Morgans out there whose ancestors once lived in Bridgend! Enjoying a welcome sunny interlude on an otherwise cold day, I turned the corner of the path that leads up to the tower and almost collided with a huge bumblebee! She was a Buff-tailed queen that had flown off from the pretty creamy white flowers of a shrub. 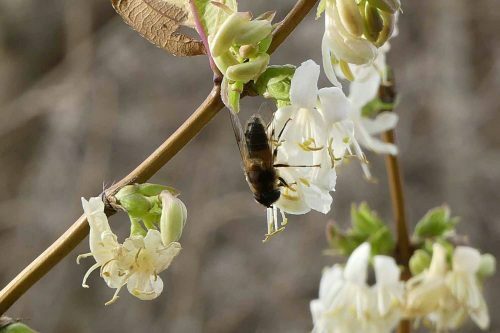 I was surprised to see her quite this early in the year; perhaps the sunshine coaxed her out, but did she know she’d find the shrub in flower or was it just an exploratory expedition? 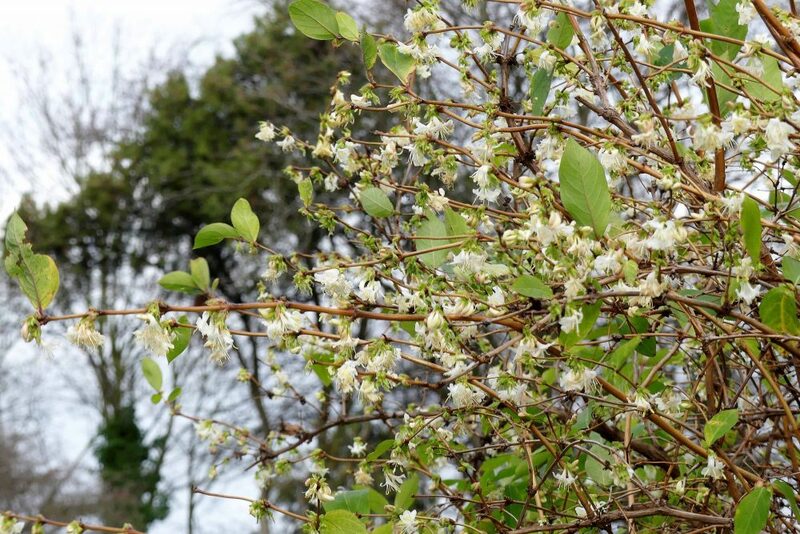 I stopped to have a closer look, and to smell the flowers of the shrub: they were gorgeously fragrant. I don’t know what it is, maybe a Sarcocca species? I’m always keen to find plants that are good for early nectar & pollen-seekers. If anyone knows for sure what is, please let me know! There was another surprise here; a large Eristalis sp. hoverfly was also out and about looking for food and sat for some time on one of the shrub’s flowers. Also flowering was a Christmas Rose, or Hellebore and there was a light sprinkling of daisies in the grass. Christmas rose – Hellebore sp. The supermarket is located at the back of the New River Village development, so I walked back along the same gravel path that I’d taken a couple of days ago, but in the opposite direction. 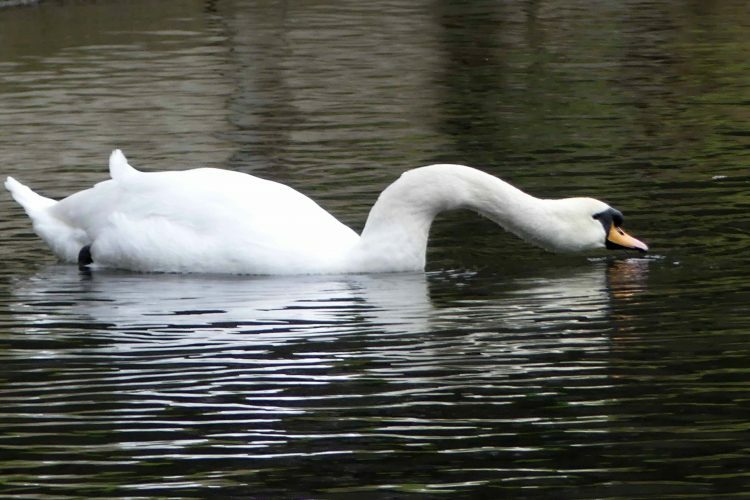 I was happy to see a pair of Mute Swans cruising slowly upriver towards me; another common species, but how can anyone not be charmed by their beauty and grace? 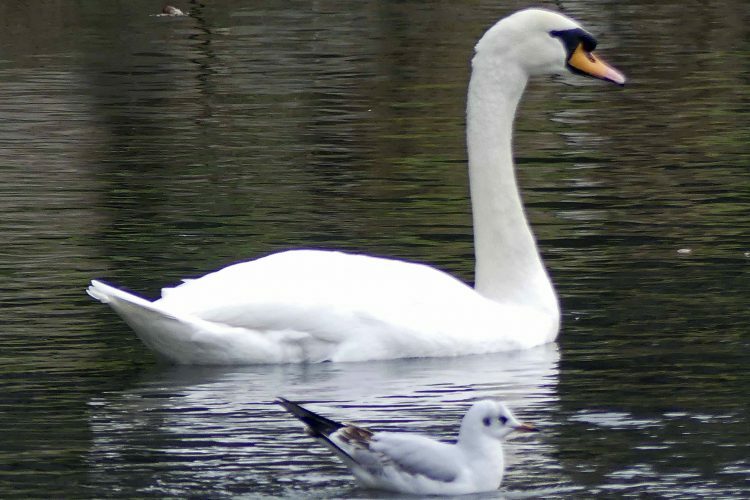 I loved this image of a young Black-headed gull shadowing a Swan. Perhaps he thought he’d grow up to look like that one day? 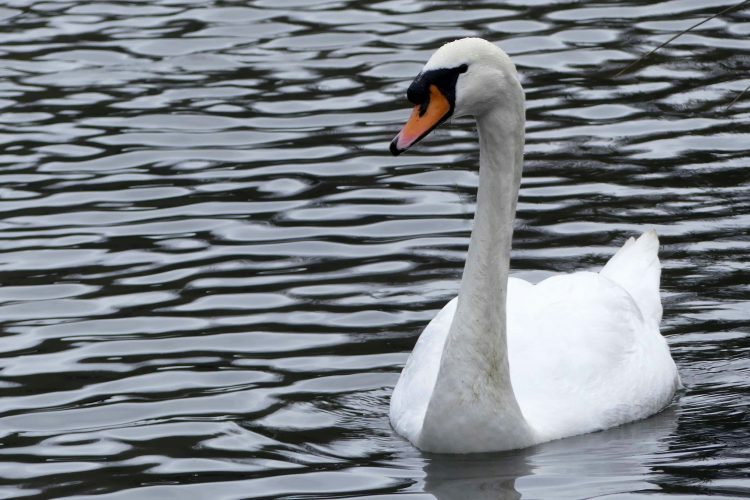 Despite their calm and graceful demeanour, Mute Swans may be extremely quarrelsome and will bully smaller species. 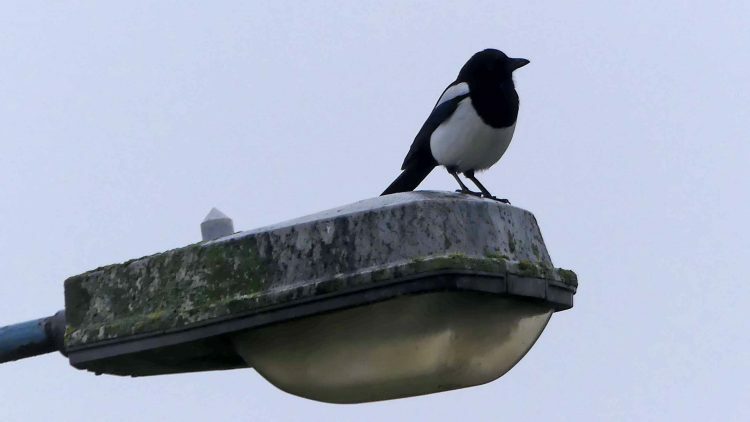 In the breeding season males stake out a large area of water, and as we witnessed at the end of last year, he defends this territory aggressively against all intruders. They are not entirely without a voice either, despite their name; when angry they hiss and snort and can occasionally manage to trumpet, albeit feebly. Most of the time though they cruise the waterways peaceably, often in their pairs, stopping frequently to feed on submerged water plants. I was going home today, but before I left there was time for one more walk up to Alexandra Palace, this time with my son and grandson who were both in need of some fresh air. Fresh air was certainly what we got, along with wind and a few showers of hail. This walk was a lot more speedy than my last one. 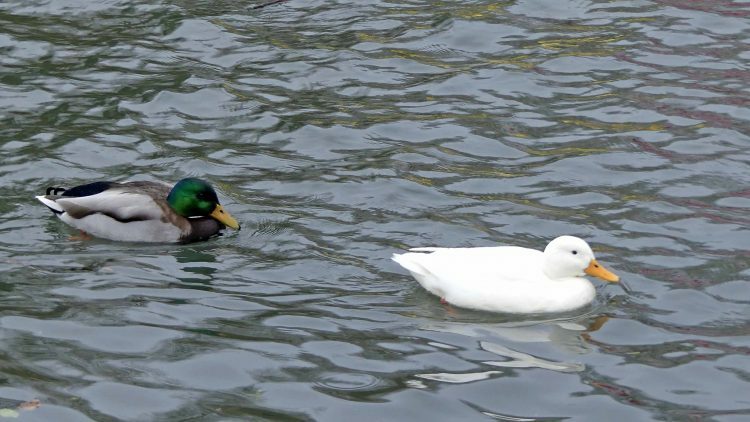 I didn’t linger on the side of the boating lake, but did spot the all-white duck out swimming with a Mallard drake. Are they a pair I wonder? 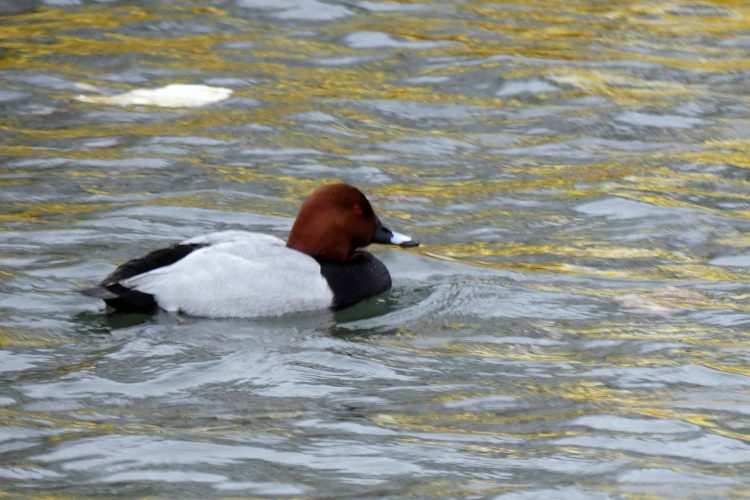 I was really pleased to see the Pochard drake out with a female to add to my collection. On my last visit he’d been out on his own. The texture on the water surface was the effect of wind and hail; the golden highlights were a reflection of one of the moored boats. This was just hail! Pretty though. 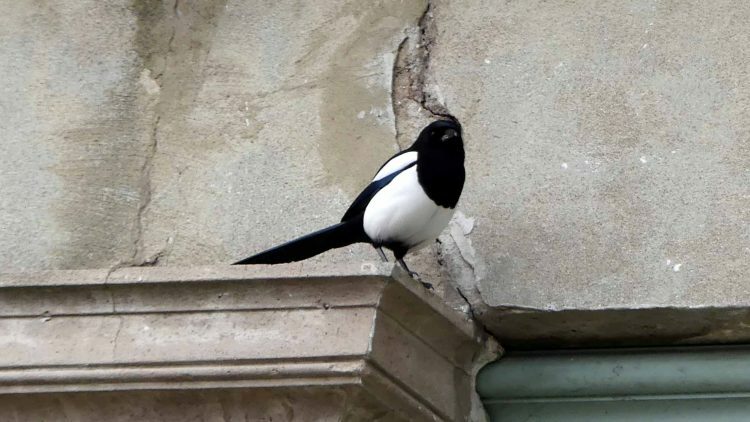 the other on a stone cornice. 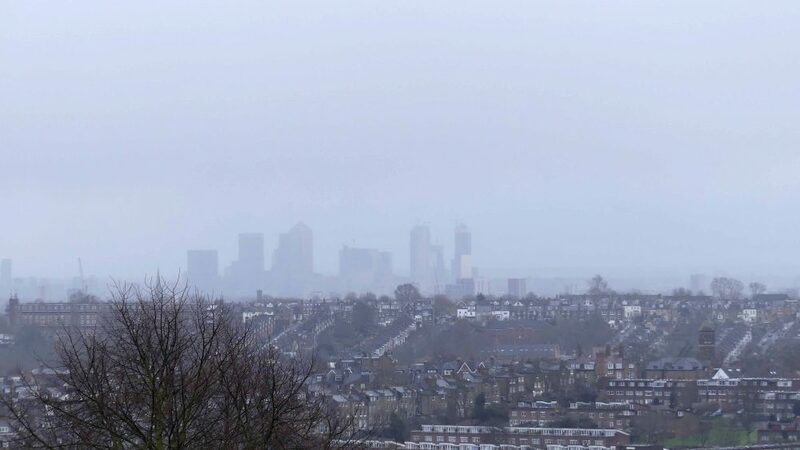 Views of the city skyline were slightly better today, but still looming up from mist. As we walked back down the hill to reach the pavement alongside Alexandra Palace Way, I spotted a flock of birds foraging on the grass. 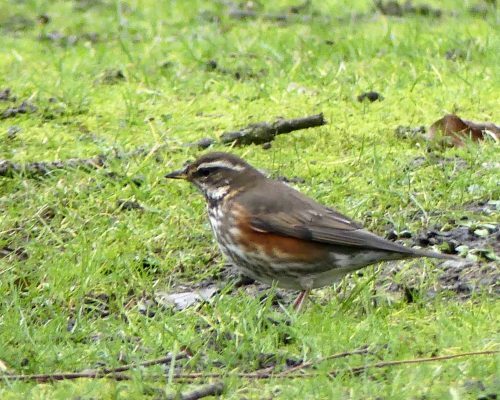 Beautiful Redwings. 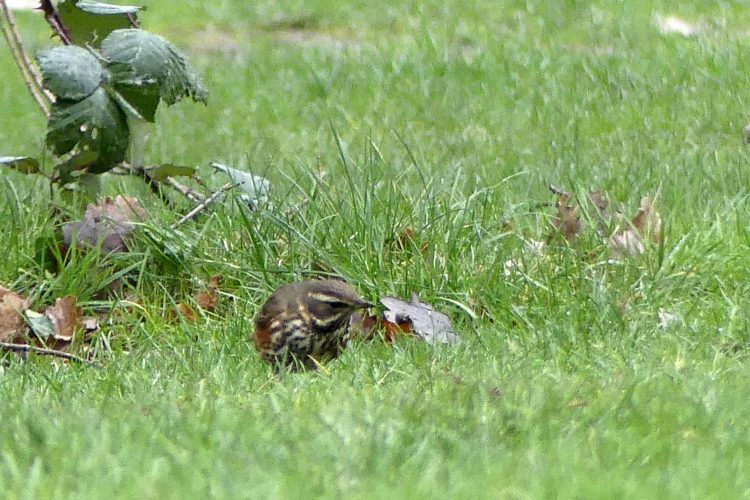 The redwing is most often encountered as a winter bird and is the UK’s smallest true thrush. The creamy strip above the eye and orange-red flank patches make it distinctive. 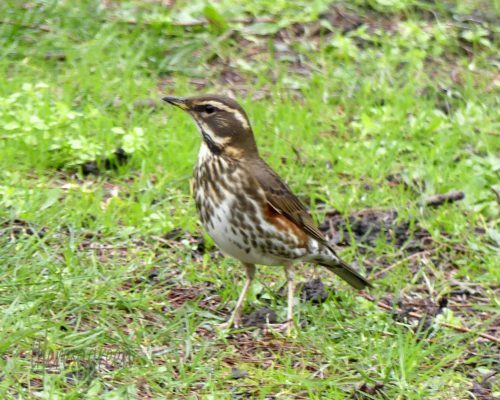 In open countryside redwings favour hedges and orchards as well as open, grassy fields. 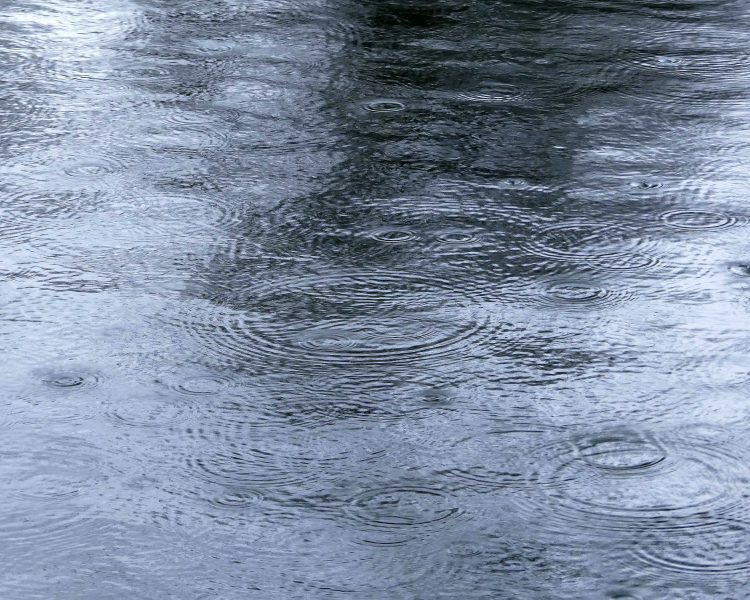 They will come to parks and gardens, particularly in periods of bad weather when snow covers the fields. 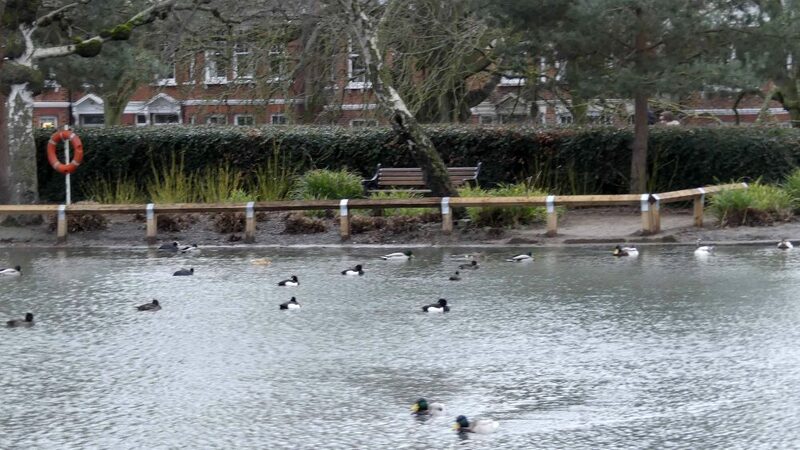 There were twenty or more birds here and they looked perfectly at ease; not at all concerned by people passing very close to them, or by me taking photographs for that matter. An unexpected treat and a lovely way to end my visit, despite the wintry weather.